specialized power saddle 155. Condition is Used. Shipped with USPS First Class Package. Take off from new bike. Lightly used. Size 143mm / Weight 233g. The Power Expert saddle features a stiff, carbon-reinforced shell with durable titanium rails to keep the weight down. Lightweight, durable, and hollow titanium rails. Great deal on a used S-works power saddle! 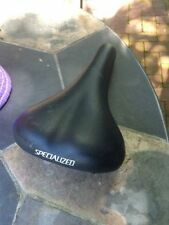 Specialized Toupe Sport Saddle 143mm. Shipped with USPS Priority Mail. 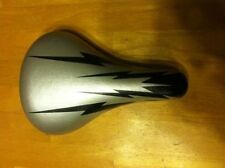 This listing is for a Specialized Phenom Expert Ti Saddle, Size 143, Color: White, Titanium Rails, Low Miles. Used in very good condition with minor signs of use and scuffs but no damage and tons of life left on it. MSRP $160.00 Please view all pictures. Shipped with USPS Priority Mail. Size 180mm / Weight 519g. Size 180mm. We owe it all to listening to you. Level 5 padding: Ideal for commuting and casual riding. Color Black. Clear lenses are designed to provide the greatest visibility while swimming indoors or in low light situations. The 2 pointy plastic pieces that are mounted on the back of the saddle have been removed. I no longer have them. Size 143mm / Weight 254g. It features a carbon-reinforced construction at the shell, along with our Adaptive Edge base that allows the outer edge to conform to your body for a near-custom fit. Likewise, at the tail, you'll find the Phenom hallmarks of a rounded, anti-snag design, and throughout the saddle, an expertly tuned construction that provides the ideal degree of both stiffness and efficiency. Specialized Romin 168mm Hollow Titanium Bike Saddle. Lightly used. Few little scratches, but in great shape ! Specialized Oura Expert Gel Saddle Women Black 155mm. Fact CARBON rails. Padding Level 2. Rails are hollow titanium. If you're looking for a light, comfortable saddle without breaking the bank, look no further. Be assured that your item will arrive safely. We are Yellow Bike Project, a 501(c)3 non-profit located in Austin, TX. Lightweight and supportive PU foam with gel inserts for increased comfort and sustained cushioning on longer rides. Lightweight and super durable hollow Cr-Mo rails. Tough, light and water resistant Micromatrix cover ”. Specialized Body Geometry Sitero Saddle. Condition is Used. Shipped with USPS Priority Mail. For sale is a black Specialized Romin Saddle. This is a basically new saddle. 155mm with TI Rails. 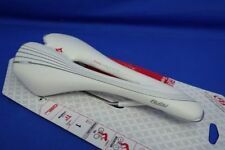 Specialized Phenom Body Geometry Saddle 143. Condition is Used. Cr-Mo rails. Great shape barely used it, one small nick in leather you can see in photo. Shipped with USPS Priority Mail. Lightweight and tough, hollow titanium rails. SWAT™-compatible mounts molded into the saddle base allow for sleek and integrated storage solutions. Specialized Toupe Sport Saddle Blk 143mm. Condition is Used. Shipped with USPS Priority Mail. Model: Romin. Width: 143mm. Rails: FACT Carbon. Specialized Riva Saddle . Condition is Used. Took this saddle off a used bike i bought. Saddle has some wear (see pictures). Selling a new Specialized Pave anodized seat clamp for 9mm road bike saddles with larger carbon fiber Rails (not regular 7mm alloy rails). Please contact me with any questions. Up for sale is a New, Take-off, Specialized Toupe Sport Saddle. Size is 143mm. Specialized Phenom Expert Saddle Black 155mm With Hollow Titanium Rails. On saw 3 rides so very lightly used. Shipped with USPS First class mail. Size 155mm / Weight 253g. The Ruby Expert features Adaptive Edge base construction technology that allows the saddle's outer edge to adapt to the shape of the body. SWAT™ compatible mounts molded into the saddle base allow for sleek and integrated storage solutions. Specialized Phenom Expert Saddle, 143mm, Carbon Base, Titanium Rails. Condition is New. This was included on my Roubaix Pro when I bought it. I elected to go with a different saddle. There is no wear. All Black Specialized Riva Body Geometry Bicycle Seat 155mm - Ships Free! Brand new never used! Perfect condition. See the photos please. It’s sold exactly as you can see it there. No returns Thanks! This listing is for a Specialized S-Works Power Saddle, Size 143, Color: White, Carbon Rails, Low Miles. Used in very good condition with minor signs of use and scuffs but no damage and tons of life left on it. MSRP $300.00 Please view all pictures. Shipped with USPS Priority Mail. I bought this when I was looking for the perfect saddle for long distances. It's a great saddle, just not my choice for a couple hundred miles. I took it off the bike, and it has been sitting in a tote waiting for its next rider. I'm moving and its time to clean out the basement. Overall this Specialized Henge Comp saddle is in good shape! There are 2 notable scuffs shown in the pictures but do not affect performance. Model: Henge Comp. Weight: 282g. Slightly used Sworks saddle. Original spec on Sworks Tarmac Disc. Used 2 rides and switched back to my old saddle. Specialized Henge Body Geometry Saddle. Bought this saddle new a couple years ago, mounted it but never rode it. I ended up selling that bike and kept this saddle. Specialized Canopy Comp, hollow Cr-Mo rails. Rubber waterproof seat. Size 155mm / Weight 345g. Size: 155mm. Rails : Hollow Cro-Moly. SWAT™-compatible mounts molded into the saddle base allow for sleek and integrated storage solutions. Gender: Female. Lightweight and supportive PU foam for increased comfort over the course of longer rides.